Remembering tables is a hard and repetitive task. However, there are some tasks that will help make remembering them easier. Math is not known for being easy. Sure, some people will claim, ‘Oh I have no problem with Math’ or that ‘Math is fun and easy.’ While that may be the case for some select few, for the majority of us, math is requires hard work and dedication. One of the tasks that especially do so is remembering tables. This is definitely not easy or fun. So, here are some tips that will make remembering tables a little easier. 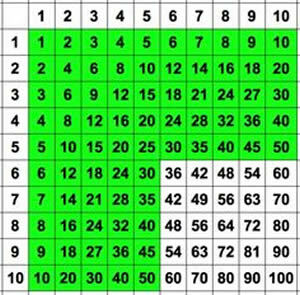 Try to remember the sequence of numbers for each table. So for the 2 times table it would be 2,4,6,8,10,12,14,16,18,20. Once you have that memorized then add the 2x1, 2x2, 2x3, etc. to it. Eventually you will remember the whole table. Do this for each table. You can also turn the tables into songs. It is much easier to remember the lyrics of a song rather than to memorize the tables. You can make up your own song, get a grownup to help or there are many songs already available on the internet. Sometimes it is easier to visualize things rather than just to memorize them. So, instead of trying to memorize some boring and bland tables, instead convert them into a chart. The most basic chart consists of 0 to 10 on the top of the columns and 0 to 10 on the top of the rows. Now fill the cells with the answer you get when you get multiply the row number with the column number. For example: 0x0, 0x1,0x2,…10x1, 10x2, 10x3, etc. Now you can use this chart as a guide for all tables: from 0 to 10. You can also practice filling the table over and over again to help you remember the tables. Another option to help you remember tables is using Vedic Maths. Vedic Maths has lots of tricks to make Math easier and fun. In fact, it can also help you on higher levels of math than just tables. Mnemonics is a technique in which you associate one with another thing which is easier to remember. Hence, by word association you remember the original thing that you wanted to remember by remembering a secondary easier thing. This can also be applied to remembering tables. For example: 5, 6, 7, 8; 56 is7x8. This can be done with any and all of the tables. This is the oldest trick in the book. You learned your counting on your fingers, so why not learn this on your fingers too. So for example: add 2 fingers to for every number that you want to multiply by 2. So, for 2x4, add two fingers four times, so 2+2+2+2, which becomes 8. Instead of memorizing all the tables be start about it, instead only memorize half. How will that work, you ask. I will tell you. Suppose you know the 2 times table, but don’t know the 9 times table. 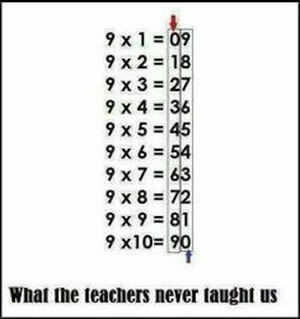 You know that 2x9=18, but did you know that 9x2=18. It doesn’t matter what order the numbers are in, the answer is always the same. So, be smart and only memorize half of it, you will automatically know the second half. The last tip to keep on repeating it over and over again, or keep studying it, or keep practicing it Whatever method you choose, just keep on going back to it, because once you memorize it, you always face the risk of forgetting it again. So it is important that you keep on studying.